Writing this final post while I’m an emotional wreck might be a bit troublesome. 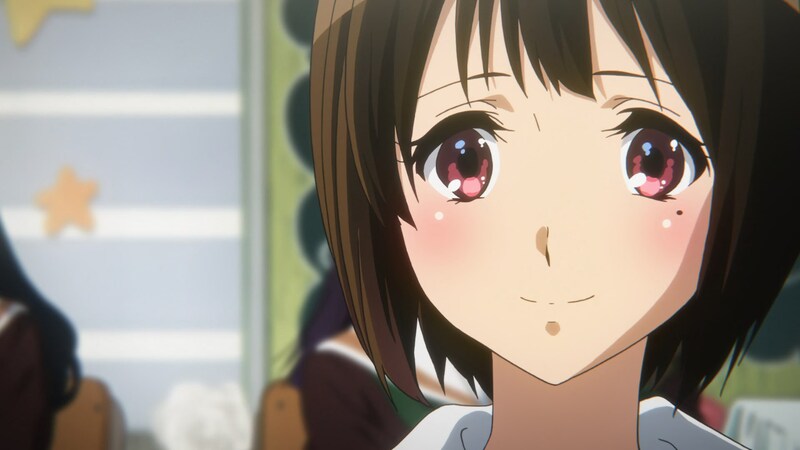 The books beyond the first one only exist due to the original anime’s success, and now the author – who has incessantly tweeted her love for the adaptation – has reacted to the finale by saying she still wants to write more Euphonium. If the show has this effect on the person who wrote the series to begin with, maybe I shouldn’t feel bad about being destroyed by it. That’s the excuse I’m going with. This episode was a farewell party with many details to unwrap. Reina playing with the upperclassman she gained the solo from in line of sight, not with the intention to compete this time but as a sincere farewell gift. And Kaori smiling back, though her hands still haven’t gotten over it. 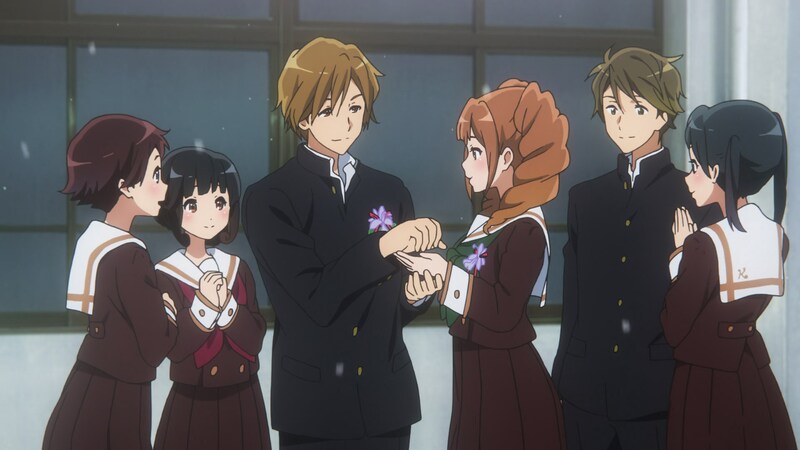 Explicit bonds are addressed for the last time as Yuuko has silently received her ribbon – as it should be, for many reason – and relationships that have always existed in the background have their moments as well. Every goodbye has a story behind it. Even the audience is invited to this nostalgic party, since the third years finally play the lively song featured in the first teaser PV, appropriately named Starting the Project. But if there’s one scene to highlight, it clearly has to be the final – or is it? 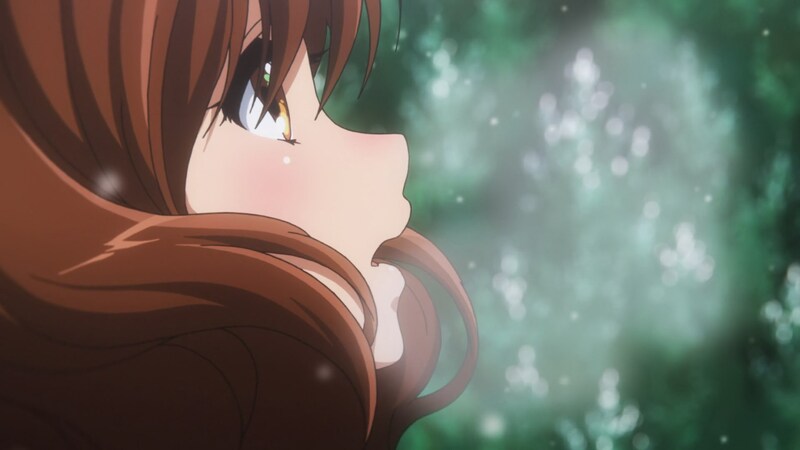 – encounter between Kumiko and Asuka. Throughout the episode you can feel the former growing increasingly restless, unable to deal with the third years graduating. 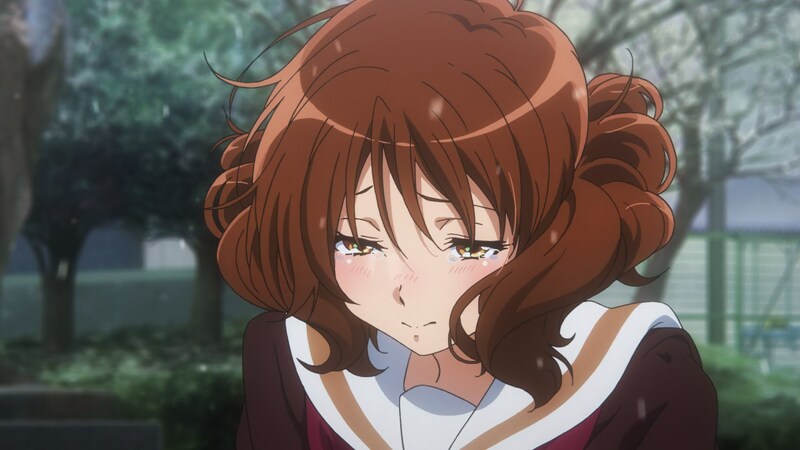 The current Kumiko is far from the one who began the series though, so even in this painful goodbye she decides to be proactive and seek Asuka one last time. 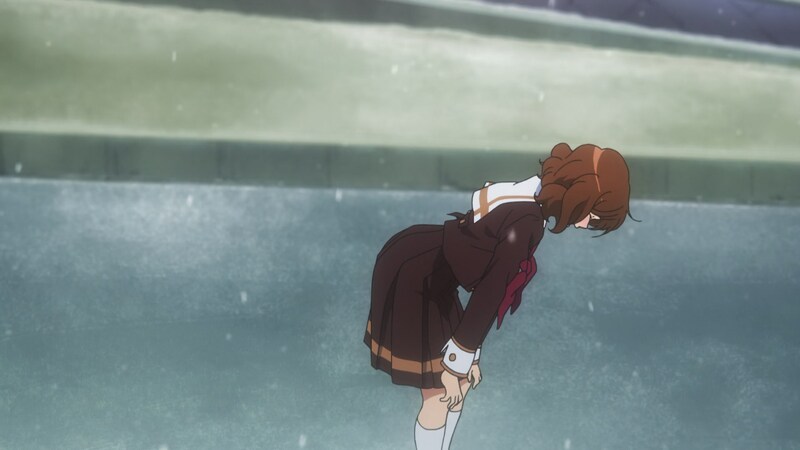 Much like she did in the final scene with her sister last week, Kumiko’s been making sure these uncomfortable situations don’t sit unresolved, which is understandable coming from the person who felt troubled for a long time for not clearing up her feelings to Reina. After expressing how much she’s come to love her, Asuka replies by saying their relationship isn’t over. This elegantly ties into the very first scene of the series, giving context to a scene we already saw. 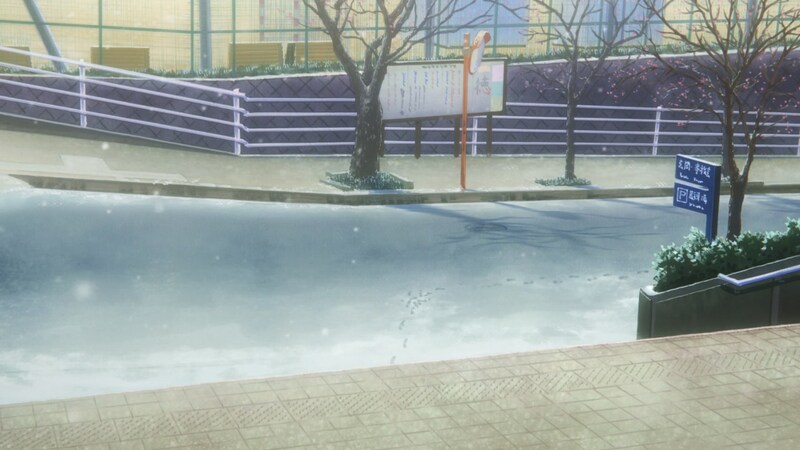 Now we know the owner of the footsteps in the snow that Kumiko gazed at, and can understand her reaction when she looks at the notebook. Very brief new cuts are inserted, but the effectiveness of a scene we’ve technically already experienced speaks volumes of the weight of their bond. 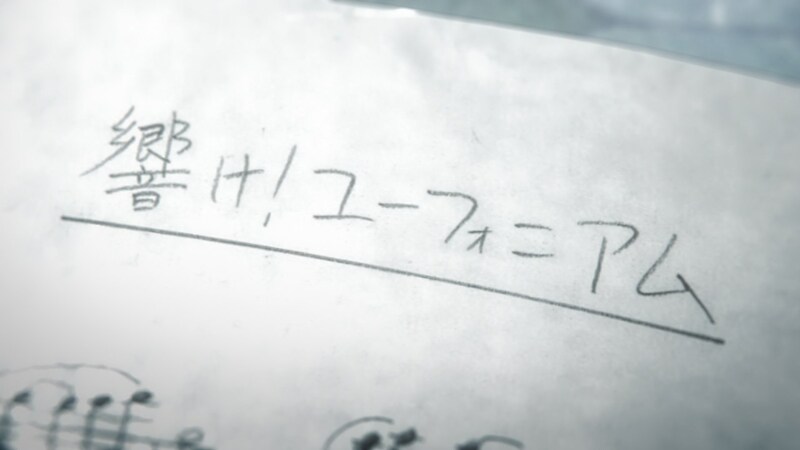 I believe that Naoko Yamada handled the first half of the episode, followed by Eisaku Kawanami and then Tatsuya Ishihara on the very last scene – which ties to the first episode he already storyboarded and directed. Quite the unconventional way to split the workload, but it’s something you can get away with for the very last episode of your production. 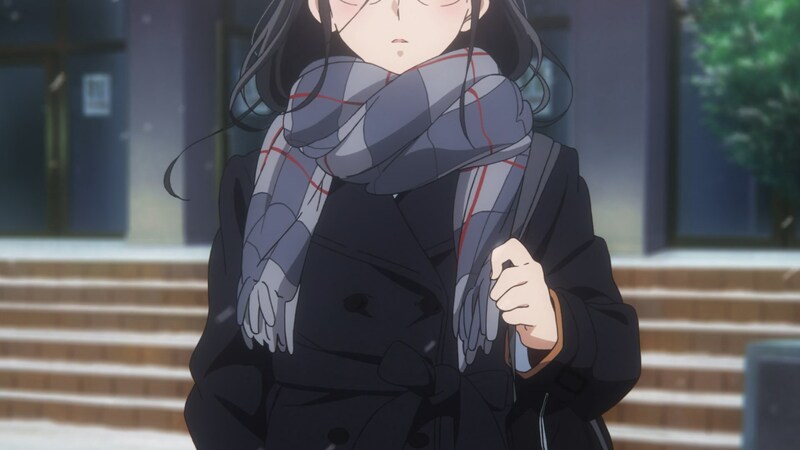 The key animation unit from the sixth episode returned for the finale, though without Kayo Hikiyama who likely had already moved onto Maidragon at that point. And leading them we had the pleasure to enjoy Futoshi Nishiya’s work as animation direction, on his first full episode for season two. After a project as demanding as Koe no Katachi, it feels like he effortlessly pulls off this level of detail and emotion. And for those of you who enjoy picking apart personal drawing quirks – yes, his distinct silhouettes are also present. 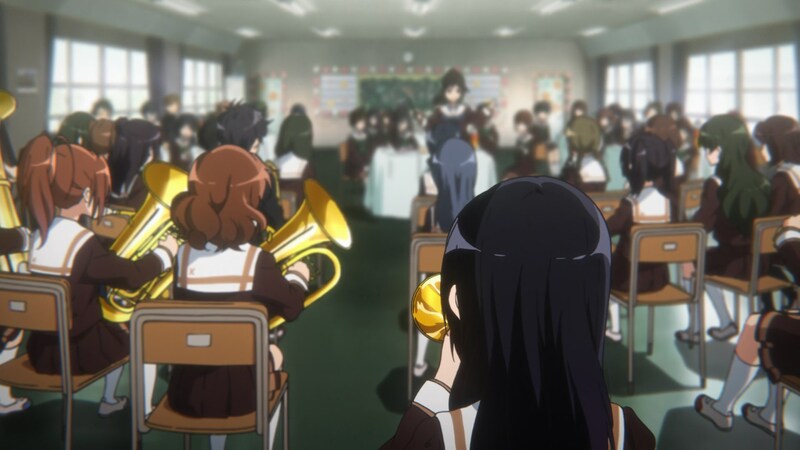 I have to say that I was particularly impressed by the photography team’s work this time around, standing out even within Euphonium’s general excellence in that field. Moments like the morning train ride and particularly this were beyond striking. Yet another way for this show to feel like it’s set in an actual world and not fake backdrops. I’m still trying to collect my thoughts on the show as a whole, which isn’t proving to be easy. 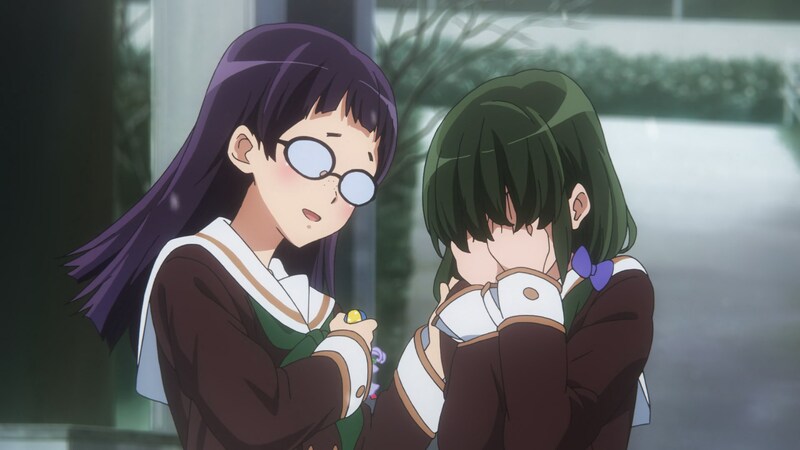 During the first arc I felt the second season of Euphonium was a worthy addition to the franchise but not one with as much standalone power as the original, but at this point I might love it just as much. 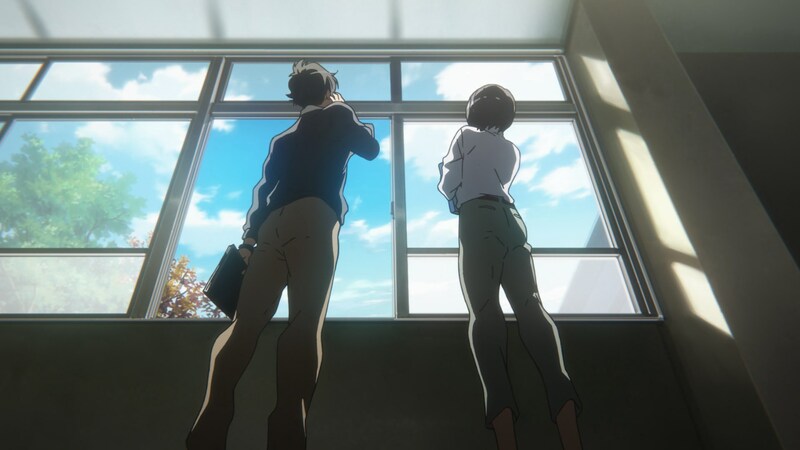 The differences seem to come down almost entirely to the structural decisions – the first season’s cohesion was born from their attempt to adapt a single novel, while the sequel’s more scattershot yet with way more highlights approach is due to the presence of multiple arcs. I suppose your interest in club politics will also be an important factor here; the band has been treated like an ecosystem of its own until the very end, but the original series definitely focused more on the internal power struggles and balancing factions. Either way, I don’t actually find myself thinking about this much, since all I had in mind was the beautiful bond between the two euphoniums. One thing that definitely hasn’t changed is the fact that this series finishes with so much momentum it almost feels like cheating; I still think the last few episodes of season one fooled half the audience into retroactively believing the entire series carried that much inertia and power, but perhaps that trick is also part of the show’s repertoire. If it’s been fooling me into thinking it’s excellent then it’s done a great job, because I’ll walk off feeling it earned my tears. The final production remarks won’t be much of a surprise if you’ve been following these posts. I expected the series to gradually improve and that’s what happened, once again with the fifth episode marking an inflection point. 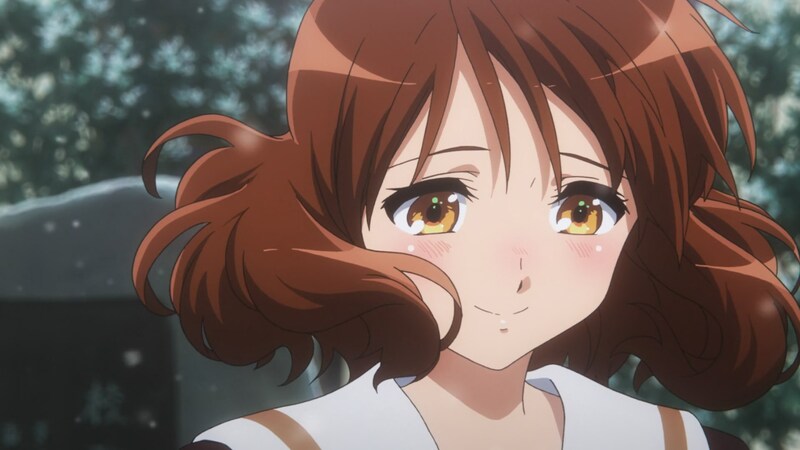 Euphonium still proudly stands as one of the best directed series KyoAni’s had their hands on; it lacks the brilliant construction of gems like Hyouka, but on a per episode basis it’s hardly matched by anything. 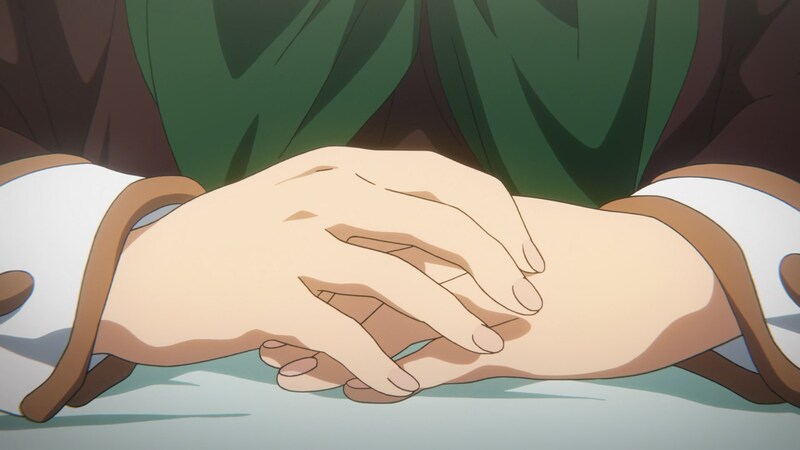 The newcomers to the directional rotation have made forgetting about the people who weren’t available this time very easy – Taichi Ogawa is as trustworthy as ever, and most people would point to Taichi Ishidate’s episode 9 as the highlight of the entire season. On an animation level I’m satisfied as well. Once again it peaked during a Yoshiji Kigami episode, though this time it was a spectacular performance rather than a beautiful character introspection like the original episode 12. The first season boasted of more charismatic sakuga highlights – concert aside – but also more isolated ones, while this series has by all means delivered more notable cuts. 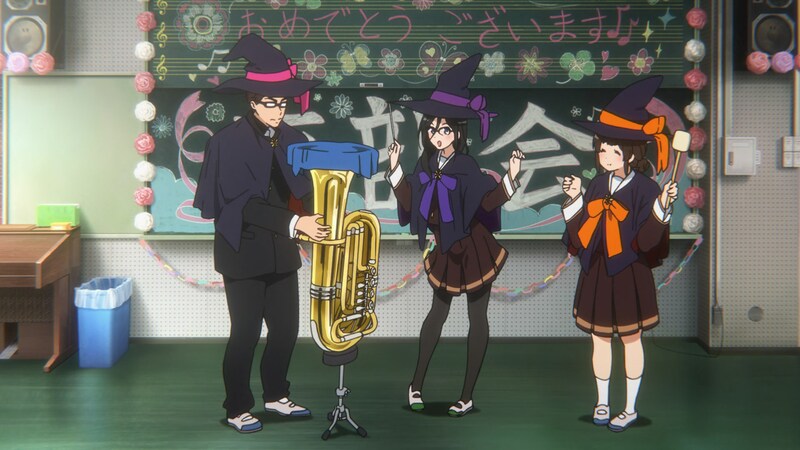 But with the permission of key animation gods like Tatsuya Sato, Euphonium has always been more of a chance for the animation directors to show off their prowess. And that they did! 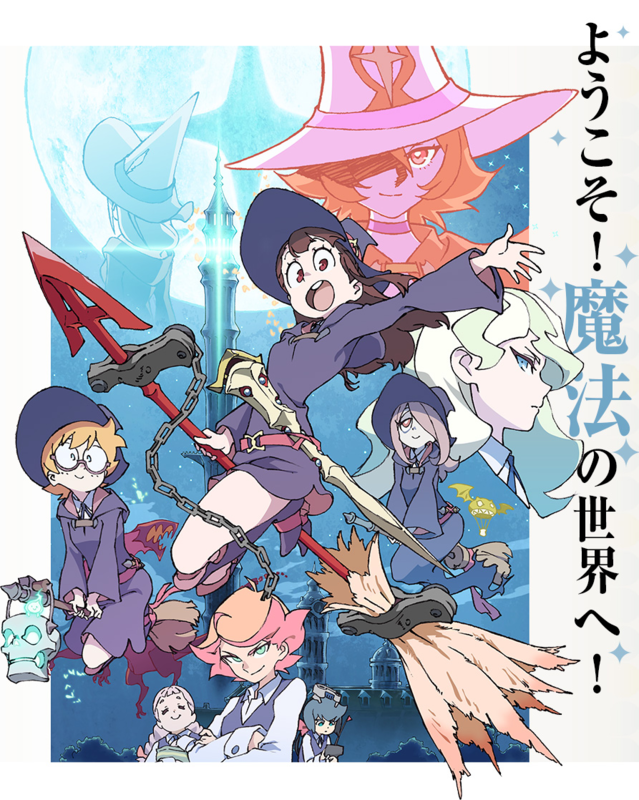 We end with a veteran one like Futoshi Nishiya doing a gorgeous job, but I would like to reiterate the young talent instead; there have been multiple promotions during this series, and seeing newcomers like Akiko Takase pull off outstanding work makes the studio’s future look bright. I don’t think I’ve fully accepted the show is over yet, but that’s it as far as my episode coverage goes at least. I’ve had a lot of fun writing about the series and its staff, and being thanked by some people who found it instructive and even somewhat interesting has it made it all the more worth it. See you next season with an entirely different show! From witches to witches I go. Three storyboarders/episode directors on this episode. This may be a first for KyoAni. But only six key animators this time. If Ishihara only did the last scene then it’s going to be the most misleading stat of all time, but a pretty funny one too. No surprise about the small team though, they had a bunch of capable people with enough time for what the episode entailed. 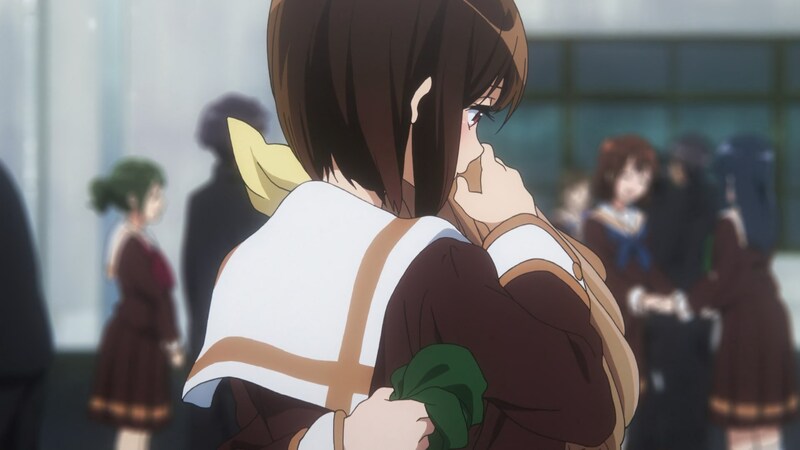 Eupho’s last episodes have required very little staff. I can’t wait for Dragon Maid. I’m excited to see how Takemoto and Maruki handle the material. Especially the latter, he’s been killing it this year, with stellar work on Phantom World, Euphonium and Koe No Katachi. Glad you enjoyed both the show and the coverage! I hope you’re going to cover Dragon Maid as well. I’d love to see the sakuga working in that. Not through individual posts like this (I’ll move to LWA instead) but I’ll talk about it whenever there’s work worth highlighting! 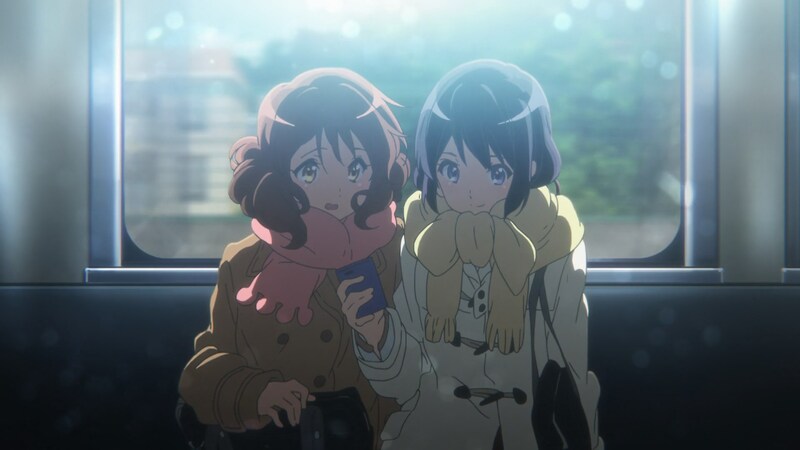 With the announcement of a “Complete Book” covering all of season 2 being published in mid-March, you can look forward to seeing much more Euphonium coverage next year too! Thanks~ I’ve enjoy doing this kind of coverage so I’m fairly sure I’ll continue with other series. It’ll be fun to tackle an entirely different series to force me to handle these in a different manner. Just finished binge watching this show whilst reading your weekly coverage in between episodes to find out who worked on what. Had a blast doing so. Part of me won’t accept that the show is over. I’m both content but also dissatisfied at the same time. Near the end, everything just moved so fast. I’m not yet done with these characters and want to spend more time with them. The surprising anticlimax in episode 12 was quite a large pill to swallow, but I feel that ultimately it’ll play a large role in keeping this show vivid in my memory. I can relate to this, the feeling of it being over hasn’t really settled for me either. The ending is as cathartic as it was going to be and yet I also feel bad about no longer being able to follow the lives of these people.